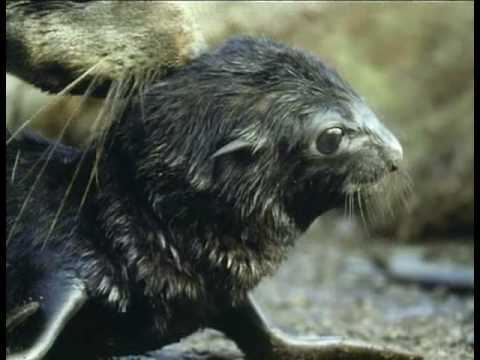 Antarctic Fur Seals (Arctocephalus Gazella) were hunted to the brink of extinction during the 18th and 19th centuries. Although the species has made a remarkable comeback, they suffer from a diminished gene pool and consequently depressed immune systems are not uncommon. They are listed on Appendix II of CITES and enjoy protection via various bits of legislation including the Convention for the Conservation of Antarctic Seals. Increases in krill fishing (on which these seals are heavily dependent) global warming and disease place additional stress on these animals. Entanglement is also a major concern, with an estimated 10 000 seals being affected each year. The vast majority of these animals (more than 90%) will breed on the seasonally ice-free Antarctic polar front of South Georgia. There are however some smaller breeding colonies on various other islands. Breeding and birthing takes place during the months of November through to January. The pups, which are born with a black coat, usually weigh in at around 5-6kg and measure around 70cm at birth. They shed their black coats when they are around three months old. This is replaced by a silvery coloured coat, which in turn changes to greyish brown as the animal matures. The females will stay with their pups for the first few days before leaving on foraging trips that last 3-5 days. She may travel up to 150km away from the breeding site before returning to nurse and suckle for 1-2 days before going off again. Pups take approximately four months to wean. Both males and females reach sexual maturity at around 4 years, though males will only get territorial rights when they are older. Adult males weigh on average around 180 kg and measure 1.65 m in length. They do not feed at all during the breeding season as they are too busy defending territories and harems. Males can mate with as many as twenty females in a single season. Females are much smaller, weighing in at an average of 40 kg and measuring 1.3 m in length. Males live to about 18 years while females live to approximately 24 years. They are preyed upon by sharks, Killer Whales and even Leopard Seals. In January of 2000, Chilean scientists discovered anti-bodies in Antarctic Fur Seals for the disease Brucellosis Unusually high levels of toxic heavy metals have also been found in Antarctic Fur Seals, though their origin is unknown. There have been calls from some scientists to downgrade the Antarctic Fur Seal’s conservation status. These scientists claim the growing population is causing environmental damage by polluting lakes and damaging plants. The species was formerly known as the Kerguelen Fur Seal. It gets its name from a German corvette, the SMS Gazelle, which collected the first specimen off Kerguelen Island. They form part of the largest concentration of marine mammals on earth, around South Georgia. This is because they are heavily dependent on krill. Extensive whaling has caused there to be a surplus in krill, leading to an imbalance in the trophic cascades or food chain which has enabled these seals populations to grow. These animals were hunted to the brink of extinction. In the early 1900’s, they were believed to be completely wiped out. Thankfully, a small population on Bird Island remained un-detected and continued to breed, thus saving this species from a certain demise.